Alright, I'll admit it. There once was a time that I feasted on all-you-can-eat joints. Yah, I was hungry and quality did not matter much. However, as time passed, it became apparent that this type of gorging was unhealthy and not very tasty. Mind you, there are some exceptions to the rule; but for the most part, we really do make compromises when we do a buffet. Naturally, there must be realistic expectations and trust me, I do go into an AYCE with minimal needs. Despite those minimalistic expectations, there are some places that just defy the point of a restaurant. You know, that place that you must travel to, sp end money on and hopefully be an edible experience. If you've been reading this blog, you know that Kawawa would inevitably be mentioned. Yah, it's not a fine-dining experience nor is it even authentic Japanese food, so I should not complain right? That's what someone told me to do. Hello!?!? I'm paying well over $20.00 per person for unacceptable food. I don't care if I'm paying $2.00. If it ain't good, it ain't good. Okay, with that off my chest, I now bring you to the next candidate for worst AYCE in the GVRD. When you think that it can't get much worse than Kawawa, we have Il Uk Jo (or should I call it "Ill, Yuk, No!"). Proclaiming themselves as a Japanese and Korean buffet, I should've known better already. However, ever since I spotted the place quite a while ago and then being almost tempted to try it when I ate next door at Saigon Pho To Go, I finally did it. A few people had asked if I had tried it and were quite curious. Well, I think curiosity not only killed the cat, I probably would've done better eating it. So originally, Pomegranate and I were going to eat at another place; but due to certain events, it led us to Il Uk Jo. Either it was fate or som eone wanted me to suffer today. Everything started alright as we got a good parking spot and were led to a nice semi-private booth. Unfortunately the place was devoid of natural light and I had to use the flash. We had 2 choices for the AYCE lunch menu. There is the standard AYCE for $12.99 and the deluxe for $15.99 (or should I say "delux" like the misprint on the menu). 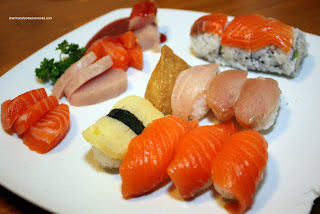 We went for the deluxe since it included sashimi, sushi and prawn tempura. 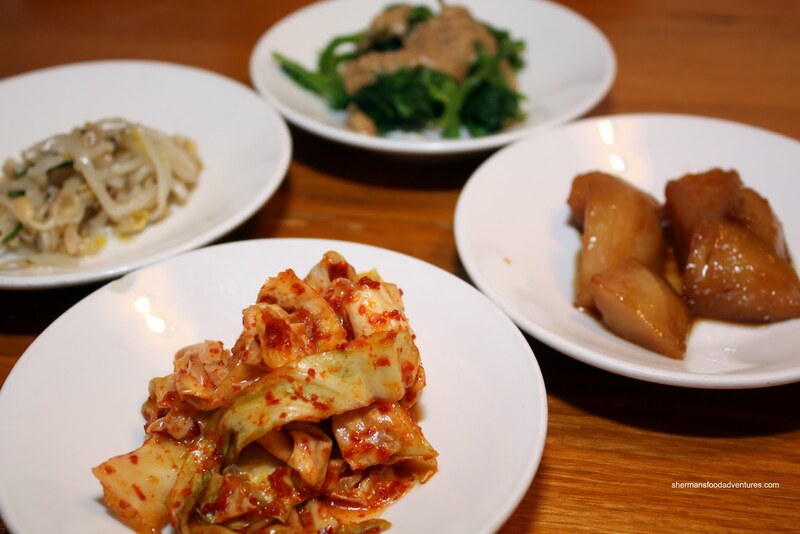 As with most Korean meals, we started with some Banch an which consisted of bean sprouts, stewed potatoes, kimchi and gomae (yah I know, that's Japanese, but I threw it in there anyways). Although it was a crunchy kimchi, I actually liked it, as with the other items. The gomae was a bit too sweet though. After that, this is where the roller coaster ride starts. Looking more like perogies than Gyozas, these pathetically oily things were terrible. Despite its deep-fried appearance, these are actually pan fried (in how much grease, I can only imagine). 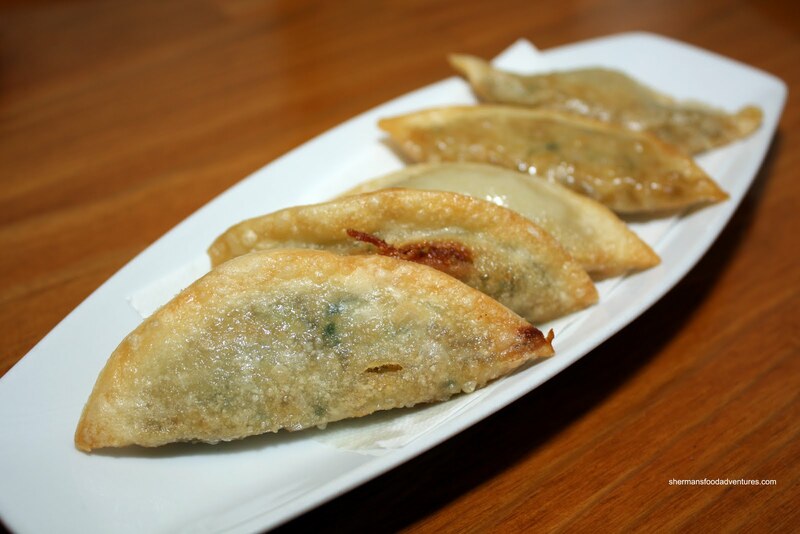 Pan-fried gyozas should not have the texture of fried wontons. Oh, it gets better (or worse should I say). The Tonkatsu sure looks alright in the picture ; yet looks can be deceiving. 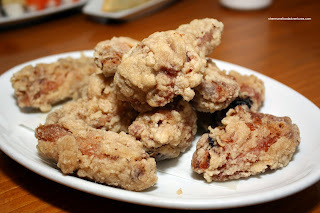 The pork hidden within the crunchy breading had the texture of cartilage. Yes, it would've been okay if we were expecting cartilage... And don't even get me started on the sauce. Let's just say they make a great sweet & sour cartilage. However, the Prawn Tempura was fantastic! Yah, you heard me right, it was excellent. Served hot and crispy, the prawn itself was sweet and cooked perfectly. Mind you, that was probably the eye of the storm passing through because the sushi was terrible. 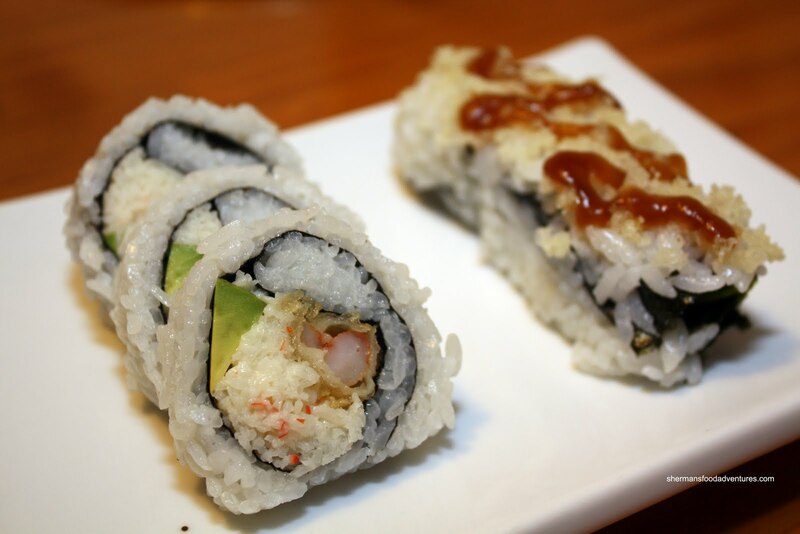 Okay, looking at the Dynamite Roll, it looks decent, right? Well, one bite into it and *crunch*. Oh, the prawn tempura must be crunchy, yes? Nope. Huh??? Look at the piece of avocado. It had the texture of an apple. For the love of... why put a severely unripe piece of avocado in the roll??? Were they looking for a textural contrast with the gummy rice, which was devoid of any flavour? No idea, but it sucked. Surely the rest of the sushi was better right? The picture sure looks decent! Yah, it does look okay eh? However, the rice, as mentioned, is just horrible. It was hard, gummy and dry all at the same time. Don't ask me how they accomplished that. As for the fish, the salmon was decent, while the tuna was not. I'm not sure if they were mimicking Lost because the Spicy Salmon and Tuna were in an alternate reality when spicy means sweet. But the strangest thing of the entire meal was the Korean BBQ. All the beef and chicken (in its marinade) arrived on the grilling plate. So when placed on the burner (which was weaker than a hotplate), it essentially began boiling the meat in its own marinade. 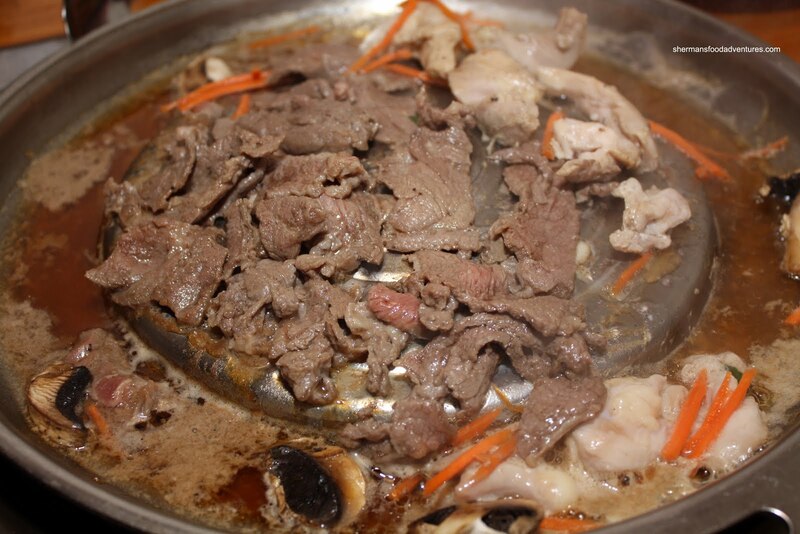 So, trying to prevent having a weird version of shabu shabu, we moved the meat onto the cooking surface (which was stone cold). As you can see, the result was essentially boiled meat that finished cooking on a lukewarm "BBQ". 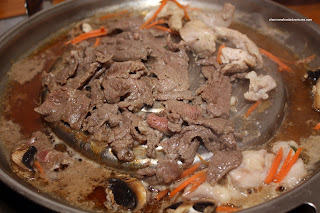 This has to be the most unsatisfying version of Korean BBQ I've ever had. We've had hot pot that is closer to BBQ than this (at Grand Honour). Fortunately, the Chicken Karaage was quite juicy and flavourful. However, there was enough batter on these things to make Tammy Faye Baker's face look normal. I had to remove it so I could actually get to the meat. When the Motoyaki arrived, I was a bit confused at the serving vessel. 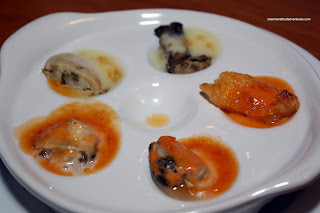 Looking like French-Japanese fusion gone wrong, the various versions of motoyaki (oyster, mussel and fish) were actually quite decent. The tangy almost like "thousand islands" sauce with the fish was surprisingly good. In the same class as Kawawa, this unsatisfying meal was not to be unexpected considering the location. However, it had some extremely low points such as the sushi rice, pathetic Korean BBQ, gyozas and tonkatsu. Yes, there were some good items; but honestly, for the price we paid, it cannot be considered acceptable. Luckily for them, there is not much in the way of competition nearby. I really like prawn tempura and the ones from here look good. 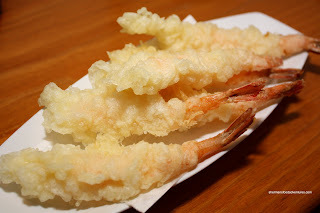 Do you know of any place that has really good prawn tempura (not too much batter, perfectly cooked, etc)? If you could give me some prices that would be extra good. Despite this gives Kawawa a run for its money (OK, bad analogy but you get the gist), I think I will give Kawawa some points for the fact it is easier to pronounce that "Il Uk Jo" or, your version, "Ill, Yuk, No" or my version "El Yuck-o". 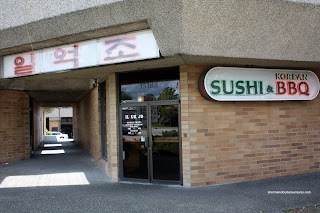 funny thing last weekend, i went to Neul Bom based on your review only to find out that they stopped the AYCE about a month ago, was planning on driving to richmond for eats when we came across this place, it was really really bad, we went for dinner and the place was pretty busy. i don't know how people can eat this crap. i too had hard rubbery avocado in the roll, my wife was wondering what the heck it was she bit into. You wonder sometimes why awful restaurant survives and is busy, while good restaurant is empty and later on closed down... The people support restaurant that don't care about there patrons and risk there health... I just hope these awful restaurant read the reviews and just change the basic of there food. Its only a matter of time before someone get seriously sick and they will get shut down but they should change before that happens! heh... at the very least, your terrible experiences are extremely funny. i agree with your thought on all you can eat. generally it isn't a very good idea but that doesn't excuse places like this for serving the quality of food that they do. sorry you had to go through that... but now we'll all steer clear - thanks! In general, I think Ayce caters to the younger crowd. Massive amounts of food (doesn't have to be good) and the chance to socilize with friends was great when I was at University. Now, I wouldn't go near one. etodac, after pondering for awhile on your question, the only thing I can recommend is to go to an authentic Japanese restaurant for good tempura. Nothing comes off as the best, but if you stick with the real places, it should be okay. Koji, that's hilarious. Well, at least what you experienced confirms that it's bad! Doug, I think they've sucked for awhile. I'm not sure if they pay attention to anyone's comments. I ate there with a friend last weekend and I seriously don't understand why it's so busy. Korean BBQ? Disgusting, I don't know what you would call that boiled meat. I felt ripped off, over $25. If that cute Vietnamese waitress wasn't flirting with us, I'd consider this a complete waste of time and money. 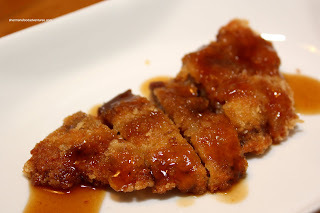 I noticed that you haven't blogged about a really good tonkatsu place so I'm going to share my newest favourite. It's Daeji in Koreatown. 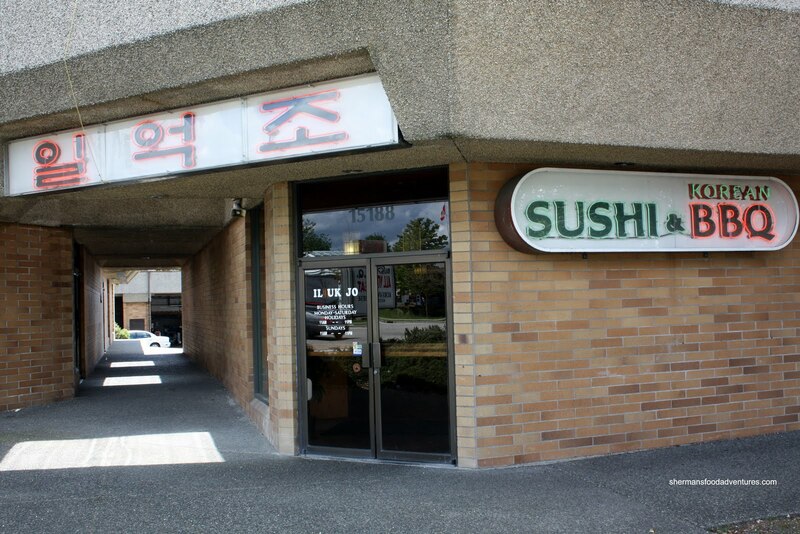 This location has changed owners several times, from Daieji to Donsta and back to Daieji. The new owners have renovated the place nicely and it's a great place for korean western comfort food like pork/chicken/fish katsu and hamburger steaks. I just wish that they would give larger portions of rice and that their kimchi stew was served hotter. Otherwise, no complaints. It's my latest favourite to go place for tonkatsu. @Holly Thanks for the tip! 2018. The place is terrible. They still dont have real kimchi. Im surprised you liked it. @Dub Step Did you NOT READ THE ARTICLE??? I didn't like it... Geez... Like read it first before commenting!